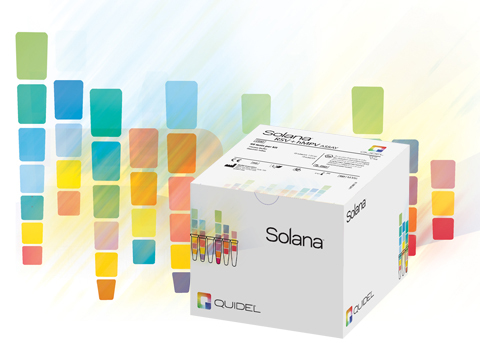 The Solana RSV + hMPV Assay is a rapid qualitative in vitro diagnostic test for the detection and differentiation of Respiratory Syncytial Virus (RSV) and Human Metapneumovirus (hMPV) viral RNA in nasal and nasopharyngeal swabs from patients with signs and symptoms of respiratory infection. The Solana RSV + hMPV Assay amplifies and detects viral RNA present in transport media containing nasopharyngeal or nasal swab specimens obtained from symptomatic patients. The assay consists of two major steps: (1) specimen preparation, and (2) amplification and detection of target sequences specific to RSV and/or hMPV using isothermal Reverse Transcriptase — Helicase-Dependent Amplification (RT-HDA) in the presence of target-specific fluorescence probes which is performed in the Solana instrument. Results are displayed on the touchscreen, can be saved to the instrument, printed, and are capable of being sent to the LIS and exported through one of Solana’s five USB ports. Solana RSV+hMPV is also supported by the power of Virena®.